Of the hit “Big Lady” musicals that proliferated on Broadway in the late 1950s and ‘60s—Gypsy, Hello, Dolly!, Funny Girl, and Mame—only Funny Girl has largely disappeared from view, except through its film version. Even Mame, probably the weakest of the group as a show—and still significantly associated with its creator, Angela Lansbury—has received a decent number of revivals with an intriguingly diverse collection of leading ladies. A recent British production of Funny Girl may change all that. (Produced by Digital Theatre, it has been made available to critics via Trafalagar Releasing for advance screening, and will soon be seen in theatres.) 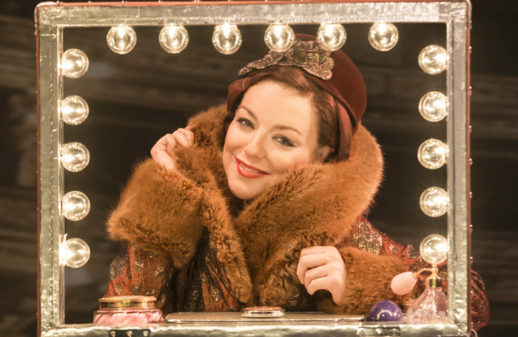 But till now, Funny Girl has proved stubbornly resistant to revivals, including the notable fizzle of a planned Broadway version that was to have starred Lauren Ambrose. Is there any doubt as to the reason for its long absence? Not to me. Color it Barbra. Streisand’s imprint on Funny Girl—and on its principal role, the great comedienne and torch singer, Fanny Brice—was notable even in its original cast album. Though Barbra was largely on her best behavior, already she was bending rhythms and phrasing, while also altering notes and styling the material to suit her own persona. Rather than wrapping herself around the character, she was audibly twisting Brice into a Streisand byproduct. By the 1968 film version, the graven image of Barbra-the-pop-icon had taken over completely, including losing one of Jule Styne and Bob Merrill’s best songs from the Funny Girl score, “The Music That Makes Me Dance,” and replacing it with “My Man,” a period torch ballad already associated with Streisand, who had previously covered it electrifyingly in a TV special. In short, Funny Girl was Barbra, and Barbra was Funny Girl. Who would dare to follow? Enter Sheridan Smith, a British singer-actor with multiple Olivier Awards to her credit. On paper she seems an offbeat choice. Her stage roles, including Elle Woods in Legally Blonde and Little Red in Into the Woods, are pretty far from the Streisand persona. Smith is also physically very different—wide-eyed and open-faced, closer perhaps to Melissa McCarthy. The differences strike me as a good thing. It’s high time we see Funny Girl through a different lens, one (dare I say it?) closer to what Styne, Merrill, and librettist Isobel Lennart originally envisioned. Even so, in Funny Girl, she is not fully immune to the looming specter of Herself. In “I’m the Greatest Star,” Smith channels some of Streisand’s musical phrasing and comic delivery on the throwaway asides, though her voice—confident and characterful, but a theater voice rather than a blue-chip instrument—is a far cry from Barbra’s. The farther Smith gets from Streisand, the better she is. In her comic mugging and facial expressions, Smith is in fact much closer to Fanny Brice than Barbra ever was, and there’s a greater sense of period style in her performance. Smith’s breakout musical moment is a sassy performance of “Cornet Man,” where alongside a pair of dancers, the number comes through as a pre-WWI pastiche, very much the kind of novelty piece Irving Berlin might have written. “Cornet Man” is just one of the terrific songs from the Broadway score that are missing from the film, which brings us to the other reason (aside from Sheridan Smith herself) that this Funny Girl film is so valuable. For the most part, this version comes closer to the Broadway original than most of us have ever seen. Yes, there are some alterations here in the score (including the insertion of the title song, written for the film), and Harvey Fierstein is credited with adapting the book. But it has the feel of a Broadway show of its vintage (1963), including how much of Funny Girl resonates with Styne’s previous blockbuster hit, Gypsy. Here, too, we have the rise of a female performer, traced against the bittersweet history of American theater. The similarities exist in individual songs as well. “Cornet Man,” for example, turns out to be Funny Girl’s “Let Me Entertain You,” which Brice begins as a gawky neophyte—but three minutes later, she has the confidence and pizzazz of a star. Frankly, Funny Girl is no Gypsy. In quality, it’s probably closer to two Styne shows that immediately preceded it—Subways are for Sleeping and Do Re Mi, neither of which had a Merman or a Streisand to turn them into box office gold. Still, as seen here in a modest but pleasing production, mounted by American director Michael Mayer, it has considerable charm and is invaluable documentary evidence of a notable show that we’re unlikely to see again any time soon. Mayer’s Funny Girl is scaled more on the lines of what one might see at Goodspeed or Glimmerglass, rather than a Broadway spectacular. But it’s attractive and effective, with its background image of tiered theater balconies and briskly paced staging. Only a few times does the design seem far too meager, as in the chorus of brides in “His Love Makes Me Beautiful,” who look like skimpily attired burlesque dancers in a sequence far from the lavishness that Florenz Ziegfeld would surely have provided. The material, too, stands the test of time—Styne’s tuneful score especially, but Merrill’s lyrics are at least serviceable, and there are some good jokes in Lennart’s book, as well as a flavorful sense of history. The cast largely meets the show’s demands, with two standouts in secondary roles. Rachel Izen is a wryly amusing Mrs. Brice, and she has the full vaudevillians bag of tricks, including snappy dance moves and a good singing voice. Among the others, some wandering New York accents and a not-always-idiomatic flavor remind us from time to time that we’re watching a British production of an American musical, though it’s not intrusive. But the production really belongs to Smith, in a performance that starts strong and grows in stature throughout the show. She’s clearly watched the extant film of Fanny Brice and has internalized her model’s frantic comedic style that always seems to cloak an inner sadness. She’s particularly strong in the dramatic scenes, which have a level of nuance one doesn’t always see in musical theater. And the audience, whose presence is palpable, clearly adores her. There were bumps in the road when this London hit transferred from the Menier Chocolate Factory to the West End. Smith, who had gotten the kind of reviews a press agent dreams of, missed some performances, and there were a couple of dicey Twitterstorms. Happily, seen here—in a skillfully filmed performance that took place in Manchester during a tour that followed the London runs—Smith is in top form. Whether this Funny Girl film will spur a revival in New York, where Streisand’s specter looms larger, is anybody’s guess. Till then, Trafalgar’s enjoyable version provides a valuable insight into the show and preserves a star turn that should be seen.